The Sprinter: Mercedes will sell them at its own U.S. dealerships. MONTVALE, N.J. -- Mercedes-Benz USA is getting back into the commercial van business Jan. 1 and will appoint up to 120 dealers to sell Sprinter vehicles. That means Mercedes will yank the Sprinter from nearly 350 Dodge dealers who now carry the van. The vans will be sold by the newly created Daimler Vans USA, which is sharing headquarters with the car division here. Contracts will be terminated by Jan. 1 with the nearly 350 Dodge dealers who sell most of Daimlers Sprinter vans in the United States. 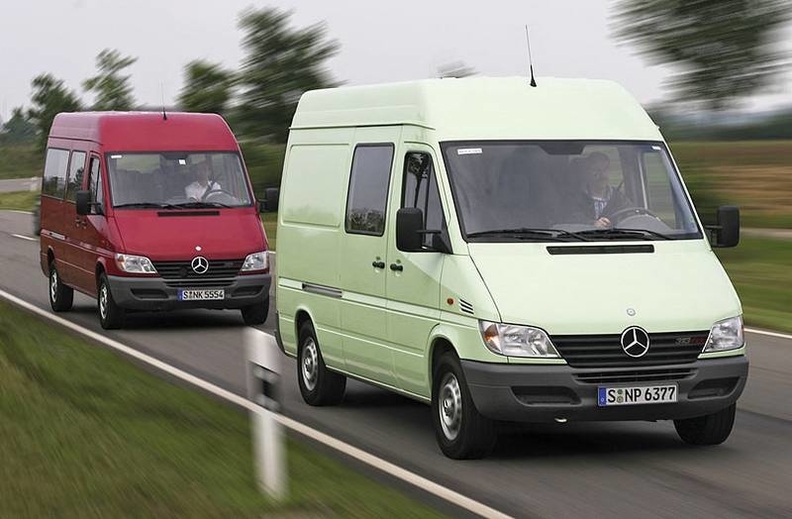 The Dodge version of the Sprinter will be discontinued, said Ernst Lieb, CEO of MB USA. Dodge has been selling the Sprinter since 2003. About 45 Freightliner dealers who have the Sprinter franchise will continue to sell the Sprinter as a Freightliner, Lieb said. Beginning 2010, Sprinters sold by Mercedes-Benz dealers in the United States and Canada will be branded as Mercedes vehicles. In January, the Sprinter will be launched with a 3.0-liter, V-6 common rail diesel that currently is used in the Mercedes-Benz M and GL SUVs and sold in all 50-states. When Daimler launched the Sprinter in the United States in 2001, it was branded either a Freightliner or a Dodge because U.S. buyers didnt know the vehicle, said Lieb. It has now established itself, he said. Claus Tritt has been appointed general manager of the new van unit. He previously worked at the van division for the now-defunct DaimlerChrysler in Auburn Hills. The Sprinter is assembled at a semi-knockdown factory in Ladsen, S. C., which has a capacity of 32,000 units a year, said Tritt. Freightliner dealers who also handle Daimlers commercial vehicles in the United States have a separate Sprinter franchise. They account for about 30 percent of Sprinter sales. That means U.S. Mercedes dealers could sell about 18,000 Sprinters annually. Dodge Sprinter sales peaked in 2006 when Dodge sold 21,961 units. Dodge sold 14,600 in 2008. Earl Hesterberg, chairman of Houston-based Group 1 Automotive Inc., said the departure of the Sprinter would hurt revenue on at least one of his company's eight Chrysler stores -- Rancho Chrysler Jeep Dodge in San Diego, which does a large business servicing them. It will create a challenge for us at at least one of our dealerships due to lost parts and service business, he said. However, Hesterberg said sales of Sprinters has been slow because big customers like FedEx and DHL buy their vehicles direct from Chrysler and there has been no financing available for small business owners in need of such a van. Chryslers new management team, headed by Sergio Marchionne who is also CEO of Fiat, is studying the idea of bringing Fiat-based commercial vehicles into North America to fill the hole left by the Sprinters departure. The Sprinter is sold only in Dodge dealerships that have a franchise called BusinessLink. Those dealerships have special tools and service bays equipped to service the Sprinter and other Dodge commercial vehicles. About 80 percent of Sprinters are sold east of the Mississippi River, said Daimler's Tritt. The average dealer would have to invest $30,000 to $50,000 in the Sprinter franchise and put up a sign, dedicate service and sales personnel and purchase some special tools and equipment, said Lieb. Mercedes-Benz would not require a separate facility for the display of Sprinters, but they wont be on the showroom floor with passenger cars or light trucks. Dealers can dedicate part of their outside lot and it could be a roofed area -- that is how we did it in other countries, said Lieb. Lieb said he will lay out the van plan to potential dealers in early October. They will be asked to stay an extra day after a regular dealer meeting in Denver.